If you are looking for the real deal, please first educate yourself about the rules that apply in TX. These recipes are cataloged with the most recent first. Click on the images to access the pdf file. Get a beef stock pack. I buy mine from Burgundy Pasture Beef. This is the foundation for many dishes, such as the Carne Guisado, which follows, and Beouf Bourgignon. Southern meal that is ideal for cooler days. Coming before September ends! Oh yum! This delectable dish is normally pretty expensive. But when you buy the whole lamb, it's a very economical treat. 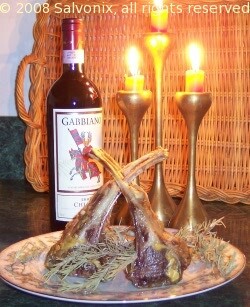 This lamb comes from Prairie Oasis Farm and it was tender, flavorful and juicy. Cook to medium rare at most for best results. If you don't know how to "French" the rack, go to youtube and search it. There are a few demonstrations that will help you. And with the extra bits of meat that are stripped away, place in a food processor with a clove of garlic and 2 scallions and mince. Add mayo, Dijon mustard and a spoonful of sauerkraut, and you have a delicious carpaccio lunch! 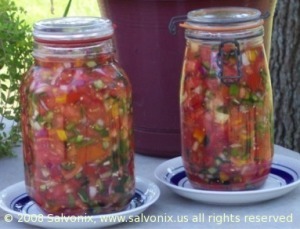 Lacto-fermented Salsa instructions are so easy. This html page shows you step by step, along with photos, how to wow friends and family with a traditional treat that contains probiotics. Shred, salt and pound. And optional Culture Starter by Body Ecology to ensure beneficial microbes and in order to reduce the amount of salt required (about 1 tablespoon per quart without starter). Wait a week or so and enjoy. Yum! Karen's Winning Tempeh Stir Fry! Our very own Karen took home a $25 gift card for this fabulous stir fry recipe found on the whole foods website. Way to go, Karen! Everyone loves Southern food. Find out the healthy versions of many classics, and try your hand at at ethnnic foods that local Texans make with flare. More coming soon.